Here’s a rare UFO article by Jim Moseley from 1970, during the gap between him leaving Saucer News and beginning Saucer Smear. It provides a fascinating look at how the ideas and attitudes about UFOs developed over the years, and leaves us wondering about just what has changed since. James Moseley, the author of the following article, has been a leader in the more energetic areas of ‘flying saucer’ studies. We felt it would be of interest to our readers to get a glimpse into the mind and life of one of the men behind the news. And future articles Jim will dig his teeth into some of the inside stories, unknown to the public, and what makes up the headlines, and what the people, who have put the ‘sensational’ into saucers, we’re really like, and really thought. Like millions of other Americans, I first became aware of flying saucers on June 24th, 1947, when an Idaho business man named Kenneth Arnold made headlines by seeing a fleet of mysterious objects while flying his private plane in the state of Washington. On that date the flying saucer era was born! I was still in high school the following year when and even stranger story hit the wire services: an Air Force pilot had been killed while attempting to fly up to a cigar-shaped UFO which was hovering high over a military base in Kentucky. Both pilot and playing it been disfigured beyond recognition in the encounter; and rumor had it that Mantell had been purposely blown up by the supposed occupants of the mystery craft. I guess I always had an attraction to the Unknown — these events which are beyond the present ability of science to explain. I remember being highly impressed by these and several other unsolved UFO cases of the late 1940s. However, I doubt if I would ever have chosen UFO research as my lifetime hobby had it not been for a chance meeting in 1953 with a rather fabulous character named Ken Krippene. Krippene was one of the that vanishing breed of soldiers of fortune who travel from country to country living by their wits. He was among other things, a writer of yarns about buried treasures. Learning of my latent interest and saucers, and realizing the topic was becoming “hot” on the non-fiction book market, he decided that we should collaborate on such a book— I supplying the raw material and he applying the finished product. By this time I had finished high school, dropped out of Krippene’s urging, I took it upon myself to make a 10,000 mile automobile trip alone across the United States, interviewing saucer sighters and whoever else could make any worthwhile contribution to a solution of the UFO mystery. I prided myself, as I still do, on having an unusually objective approach to all matters involving the separation of fact from opinion. When I began my three-month trek around the country, I honestly believed I could quickly establish whether or not flying saucers really exist, and if so, where they come from. Now, nearly 16 years later, I wonder how I could have been so naive! 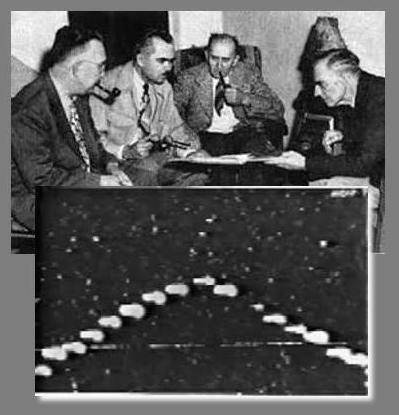 Moseley interviewed the witnesses to the Lubbock Lights. In the course of my travels, I interviewed almost all the “great names” in the UFO scene of that era — author such as Frank Skully, Gerald Heard, Morris K Jessup, Edward Ruppelt, George Adamski, Donald Keyhoe, and many others. These are the people — many of them now dead — who wrote the early saucer books, most of which were best sellers in their day. At the end of a long trip my conclusions were: Witnesses reporting UFOs in the sky are generally sincere and reputable. Although they sometimes make mistakes, a lot of them have seen genuinely unexplainable objects. On the other hand, “contactees” such as George Adamski who claimed To have spoken to space people on the ground or ridden in their ships, are solely profit-seekers and therefore not to be believed. As for the origin of the saucers, they were probably interplanetary, though their precise point of origin cannot yet be determined. As I look back now, I can compare these conclusions to my neat solutions for nearly all the world’s political and social problems, which I arrived at by the end of my first year in college. Although my UFO views have not changed radically over the years, and I have never lost my objectivity for very long, I would now seriously question every one of the statements I took to be self-evident in that early period. Perhaps my first and most severe disappointment was to find Ken Krippene really had no interest whatsoever and then honest book about flying saucers. As I was to learn many times later, there is very little market for truth or even honest reporting at lower levels of the non-fiction field. Although I had assembled hundreds of pages of notes and had painstakingly obtained the most comprehensive survey of the UFO subject available at that time, Krippene wanted such additions as a disembodied head from outer space floating across the front cover— or else no book! By that time I was already becoming well known in the UFO field as a rather mysterious newcomer, but I was totally unknown in the publishing world, and felt (perhaps erroneously) that I could get nowhere without collaborating with an established writer. So I rather sorrowfully abandoned the idea of the book. 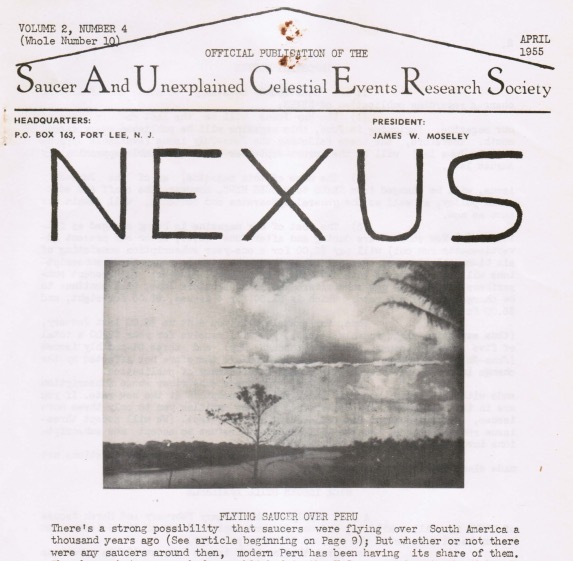 Instead, in the summer of 1954 I began publication of a monthly mimeographed magazine for flying saucer fans. 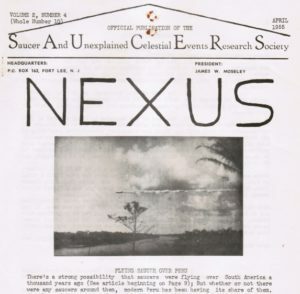 At first called Nexus, then Saucer News, it underwent many changes over the years in frequency, size, quality, and format; but essentially, it was an attempt to give an honest presentation of my own views as they evolved, together with straight news stories about current UFO sightings and articles of his opinion about other “leaders” in the field of flying saucer research. 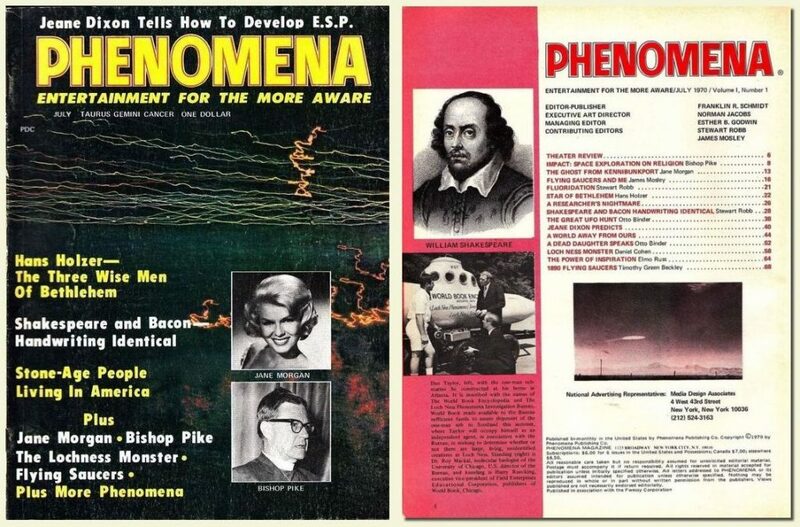 Because my views and those are my contributing writers seldom coincided with the opinions of most other UFO buffs, the magazine never grew to anything larger than a money-losing hobby. I didn’t mind, because I enjoyed setting the editorial policy to suit myself, and because I never expected to make money from the enterprize. But I did find it interesting to gradually learn another “great truth”: Readers of flying saucer journals (and no doubt the same as equally true in other fields) do not want their preconceived notions to be seriously challenged. They do not even want to be made to think. Rather, they seek confirmation of opinions they already hold; and if they fail to find his confirmation in one UFO magazine, they will simply drop it and turn to another which properly mirrors their own ideas. Specifically, I learned that the great majority of people who buy semi-professional UFO magazine such as mine, are ardent believers in the “contactees.” These readers are already convinced, through faith alone, that interplanetary saucers are a proven reality. They now seek a new religion based on the messages these space visitors have allegedly given to various “contactees” over the years. In response to this persistent pressure from my readers, I eventually dropped my anti-“contactees” articles from Saucer News, and started giving the UFO buffs more nearly what they wanted. This helped circulation only a little, for by then I had established a reputation as a skeptical or negative thinker within the field. Finally, in recent years, I took a hard second look at some of the “contactees” stories, myself and came to form my present opinion that these stories and their proponents are probably far more complex than I had thought back in the 1950s. It is apparently not just a simple case of deciding whether or not these men are lying. Quite possibly, they are telling the truth as they know it, yet have never taken the saucer flights they claim. Perhaps they and the people who believe them, are purposely being confused and misinformed by a mysterious group of extraterrestrials or others. Whatever the right answer may be regarding the “contactees,” the solution to the saucer mystery lies in a correct interpretation of their reports. I might add that this solution is eluded all UFO researchers, including myself, for over twenty years! Here we are, entering the third decade of the UFO era, still lacking proof (as opposed to mere evidence) that flying saucers exist: that lacking proof as to their origin, purpose, etc. Without the benefit of the blind faith that most of the fans indulge in so lavishly, no solution of the mystery seems possible. Whatever the saucers are, they do not seem to abide by the laws of physics as we know them, nor are they susceptible to the kinds of proof and logic which we apply to normal fields of inquiry. This realization, resulting quite obviously in frustration, has done much to dampen my enthusiasm for the entire subject. On the other hand, while these answers have continued to elude all of us, public interest and acceptance of UFOs has increased tremendously in recent years. The way this came about was quite unexpected, and tells us something about the strange ways in which public opinion is formed. Going back as far as the early 1950s, there had been stories of crashed saucers with dead “little man” found inside them. There were also hundreds of sightings of live “little men” in isolated areas all over the world. There have been dozens of “contactee” type stories, plus many hundreds of accounts of landings and near-landings, and last, but not least, there are the close UFO observations made over the years by literally hundreds of thousands a reasonably sane citizens, including pilots, scientists, and college professors. Yet, the public in general was neither convinced by all this nor even very interested. Then, in late March, 1966, a series of sightings occurred in the state of Michigan which was to transform the whole UFO picture as far as the public was concerned. The irony is that the signings were neither very detailed, nor very close, compared to the thousands of previous observations of UFOs. It is likely that most of the dozens of incidents involved nothing more extraterrestrial than bright stars or planets. Yet the wire services carried so many of the accounts within such a period of time that the country was stirred up to fever pitch. Still, it would have died down in a few more days had not another event occurred: The Air Force sent their chief scientific consultant, Dr. J. Allen Hynek, to the scene, and gave him scarcely enough time to do a thorough investigation before scheduling a press conference for him. 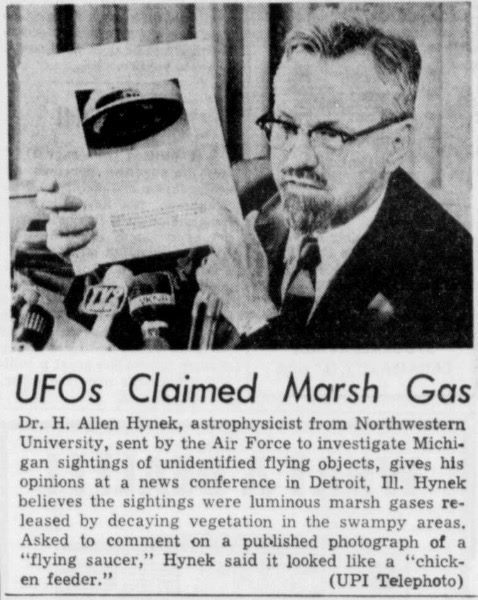 Pressed for an explanation of the Michigan sightings at the now-famous Detroit press conference, Hynek suggested marsh gas as a solution. The first obvious purpose of Hynek’s visit, from the Air Force point of view, was to quiet the public clamor. In the past, similar tactics had often worked, and that sensational UFO cases had been squashed by prosaic explanations. But this time the tactic backfired. The press ignored the fact that Hynek had quite properly qualified his statement by saying that marsh gas was a possible answer. He had not made a categorical statement of any kind. But the public assumed that he had; and, since the ‘marsh gas’ had dived at a police car in at least one instance, and had been seen to have definite shape and structural details in other instances, the public howl grew louder than ever! One direct result of the ‘marsh gas’ fiasco was a flood of mail by outraged citizens to their Congressmen, demanding to know what had really been seen in Michigan. This led to a few months later to the formation of the Condon Committee at the University of Colorado. There, a half million dollars of tax money and two years of scientific work were required to produce, finally, an official report that in essence merely reassured the public that there really isn’t anything to get excited about, after all, in regard UFO sightings in Michigan. 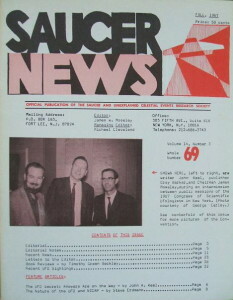 A second direct result was that saucers finally became ‘respectable.’ For many years, my Saucer News office had been listed in the New York City phone book with nary an inquiry from television or major newspapers. Suddenly, within a couple of days after the ‘marsh gas’ incidents began, I was called upon to do, radio and TV spot-news interviews for the major networks, since I was the nearest authority they could lay their hands on. After so many years of quiet obscurity, an identified form in the Michigan sky had pushed me into the spotlight. Within a few weeks I was receiving thousands of letters from in-depth television interviews; I was suddenly invited to write books and even make phonograph records; I was signed by one of the country’s leading lecture bureaus to make UFO lectures at colleges and engineering societies all over the United States; and little Saucer News office, where I had always worked alone, became overflowing with secretarial help I had to hire to keep up with the routine work. I would be lying if I said I didn’t enjoy the attention. I fully realize that there was no connection whatsoever between solving the UFO enigma on one hand, and public interest in the UFOs on the other hand. Yet I was determined to take full advantage of my unexpected good fortune, and from that point onward I made the UFO research a full-time occupation. 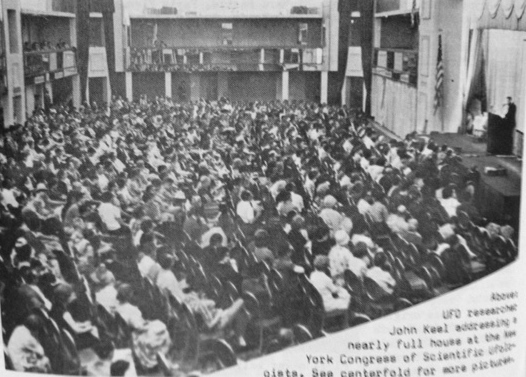 It was not long afterwards the decided to culminate my newfound fame by sponsoring what would be the largest and most ambitious indoor flying saucer convention ever held— and the first ever to be held in cynical New York City. As a publicity angle, I chose the date June 24th, 1967, the exact twentieth anniversary of Kenneth Arnold sighting. 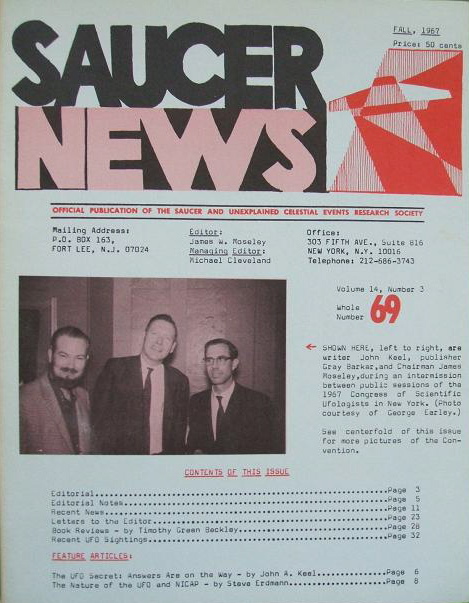 With the convention, I finally went to the full circle— from exposing the “contactees” as frauds in early issues of Saucer News to actually sponsoring them by paying their expenses to New York from various parts of the country. I did so quite frankly, not because of my renewed interest in their stories, But simply because I was quite correctly convinced that the only way to fill a huge convention hall was to give the public exactly what they wanted. My philosophy paid off— not financially, as the expenses were so high that I barely broke even in spite of a full house. But the New York news media covered us fully, just as we had hoped; and a pre-convention press conference was attended by an impressive assortment of reporters including representatives of the largest magazines in the country. What did it accomplish? Probably only add further confusion to an already confused subject. A good time was had by nearly all who attended, although I doubt that anyone really learned much, if anything. I myself self learned a lot about the do’s and don’ts of how to run a convention, but absolutely nothing new about flying saucers. Since then, things have died down quite a bit. I continued to lecture around the country and sponsor saucer personalities (including “contactees”) as guest speakers at monthly lecture series in New York City. However, the nationwide rash of books, TV specials and magazine articles generated by the Michigan signings has finally run its course. 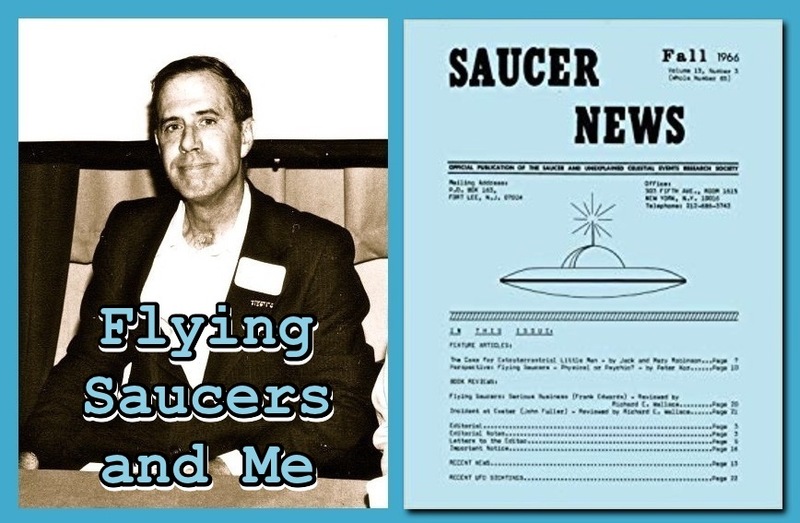 I sold Saucer News to another publisher near the height of its popularity, to give myself more time for lecturing and on-the-spot investigations of UFO cases. The lecture I give is always about the same — a summary of the history of UFO sightings throughout the ages. The questions that follow from the audience or almost the same everywhere, and the answers I give represent a calculated middle ground between skepticism on one hand and fanatical belief on the other. As for the field investigations, I hardly expect to learn anything new from them, and we all know by now the physical, tangible proof of the existence of flying saucers is an endlessly elusive commodity. For whatever reason may be, flying saucers will, I believe, long continue to be just a bit too “real” to be dismissed is fiction, and too “unreal” to be provable. So the research goes on. Some are in it mainly for the money, others because of the preconceived religious or philosophical notions they’re trying to expound. A few, like myself, maintain at least a semblance of objectivity and integrity. Where will it all end? Unless the saucers treat us to a landing at Central Park in full view Of a assembled scientist and television cameras, we will have to wait till our own technology reaches the level of detailed exploration of the moon and nearby planets. Only then can we intelligently start to narrow down the list of possible points of origin. If it turns out that our entire solar system is devoid of alien space travelers, then we weirder explanations will have to be seriously considered. Perhaps the saucers come from another dimension, or from a source so complex as to be completely beyond our present level of understanding. Whatever the answer I still feel that this field is as intriguing as it is frustrating. For me, as for the rest of the interested mankind, this is just the beginning of exploring and understanding the phenomena of the unknown. 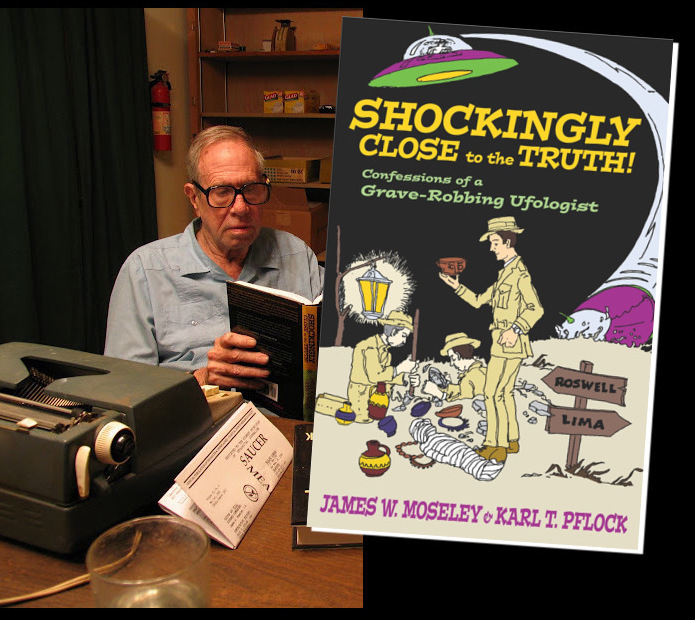 Jim’s unfinished book was eventually used to form the early part of his flying saucer memoirs co-written by Karl Pflock, Shockingly Close to the Truth : Confessions of a Grave-Robbing Ufologist, published in 2002.